If you read the title of this post and thought of a music duo then you are a well-seasoned human being (that’s a nice way of saying that you’re old, ha ha. Don’t worry, I myself am ancient. I grew up in the 80’s). (For those young ones who are puzzled, Peaches and Herb was a popular music act in the 1970’s best known for their hit, “Reunited”). Ok enough kidding around. I’m here to write about peaches! Peaches and baby food to be specific. Our local orchards and my favorite grocery store Wegmans, have a lot of juicy, ripe peaches on hand. May and June are typically peach season, depending on where you are. Where we live, lovely Jersey Peaches are available starting late June and can be picked right off the tree until August. This recipe is so simple! And healthy. Traditional chutney preparations call for a good heaping of brown sugar, which I’ve omitted here since we are focusing on babies and toddlers. In a small saucepan, simply combine 2-3 peeled and sliced peaches, 1 teaspoon of water and 1/8 teaspoon (or so, you can add as much as your baby likes) freshly minced ginger root. Add, if desired, a few drops of lemon juice for some brightness. Simmer together for 5-7 minutes, stirring frequently. You can add a pinch of all or some of the following while cooking: ground clove, ground cinnamon, ground nutmeg, or, my favorite, garam masala. 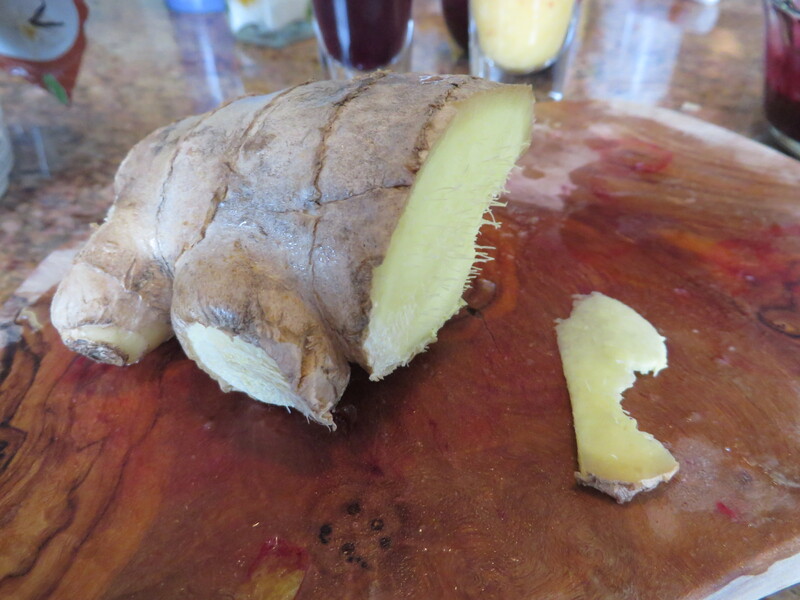 You can also simply start with ginger and work your way up! Let cool and serve. For babies, puree in blender for smoother consistency. For toddlers, serve as is, spread on crackers, or dress on a piece of turkey or ham. Rinse 4 peaches and wipe dry. Cut into halves and remove the pit. Rub flesh with a tiny bit of butter (optional for very young babies) and place 2 sage leaves into each cavity. Arrange in a baking dish skin side down and roast at 375 degrees for 30 minutes (or until flesh is extremely soft). Allow peaches to cool and remove sage leaves. For babies: scoop out sage scented flesh and puree. For toddlers, scoop out flesh (or let your toddler scoop out flesh) and go to town. Grilled peaches also have a unique and different flavor profile. 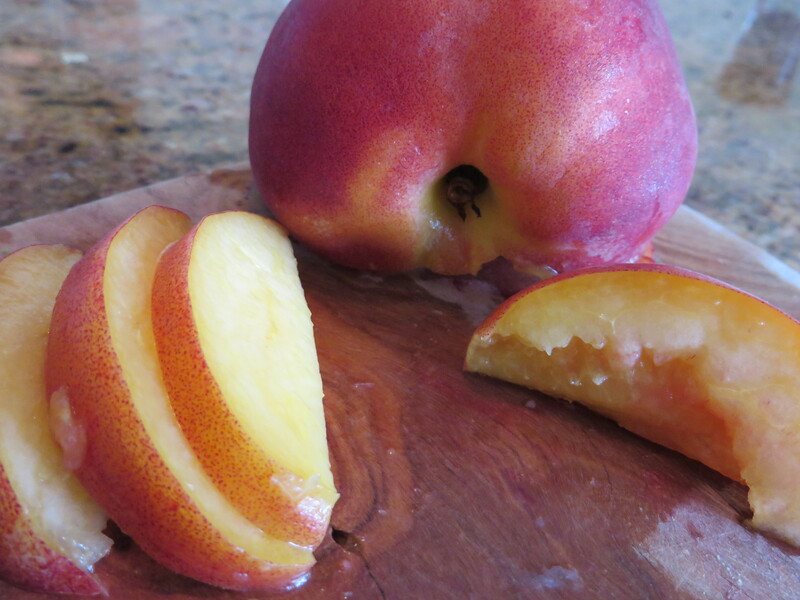 To do, simply place peach halves on grill and cook until soft, taking care not to overly char the fruit. 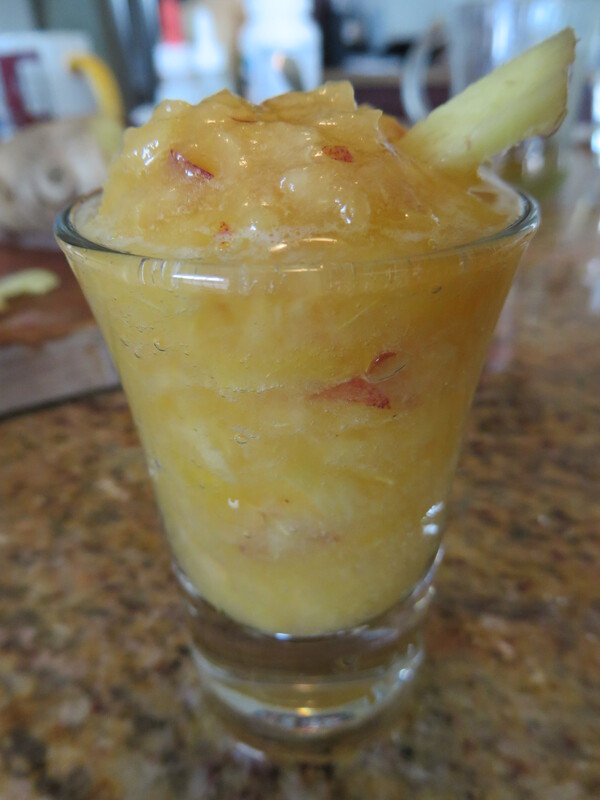 Rub cooked fruit with sage leaves and serve (pureed or chunks) accordingly. Steam or roast peaches (2-4 depending on what you want) until soft. Puree with 1-2 fresh basil leaves. This is a super summery mix that is a great way to introduce your little one to basil. You read that right! Babies in several parts of the world routinely eat chili powder (Mexican babies eat avocado with chili powder and lime juice for a snack and it’s considered totally normal). Finally! Dessert! What baby won’t go for this one? Cobblers are wonderful dishes that allow you to use a lot of familiar spices. To cooked peaches (steamed or baked) add a pinch of ground clove, cinnamon and nutmeg. You can also add a pinch of pumpkin pie spice instead. For babies, puree and serve. For toddlers, you can drizzle a bit of honey and/or add some brown sugar during the baking/steaming process. So excited for summer. Lots more recipes on the way and little baby Ela will be starting solids soon. Stay tuned!